For years, Deborah Dickerson noticed the honeybees buzzing around Memorial Baptist Church. They were always congregating around the roof. And at certain times of year, dead worker bees would litter the wheelchair ramp entrance. Dickerson and her husband have kept honeybees at their Bristol home for decades. So she was keenly aware of, and curious about, this apparently thriving colony at her Middlebury church. "I had mentioned to a couple people, sort of jokingly, if we could ever access that honey, who knows what little project could be paid for with the loot hiding under the roof," she recalls. "But it seemed pretty inaccessible." 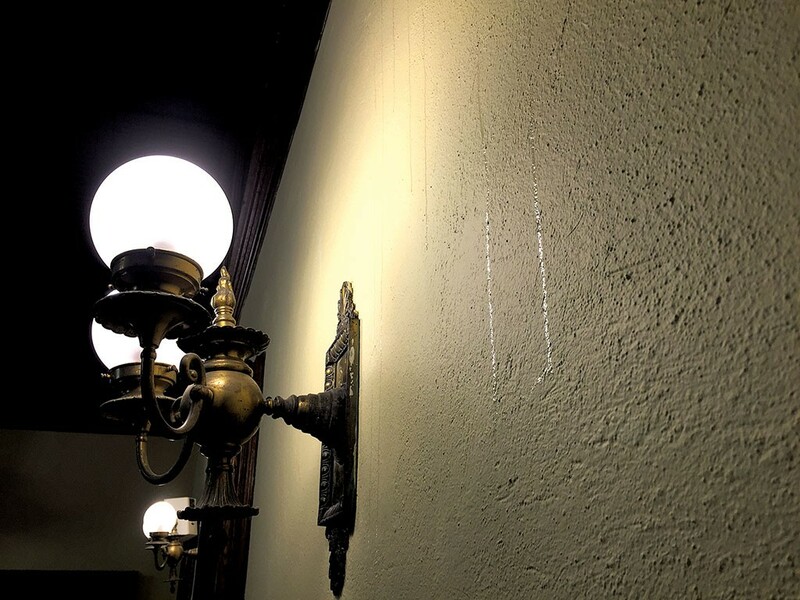 Then, early last fall, honey started dripping down the church's interior walls. "Ironically, we'd just had those walls painted, for the first time in 30 years," says Dickerson. Something had to be done about the bees. Fortunately, the timing was just right. 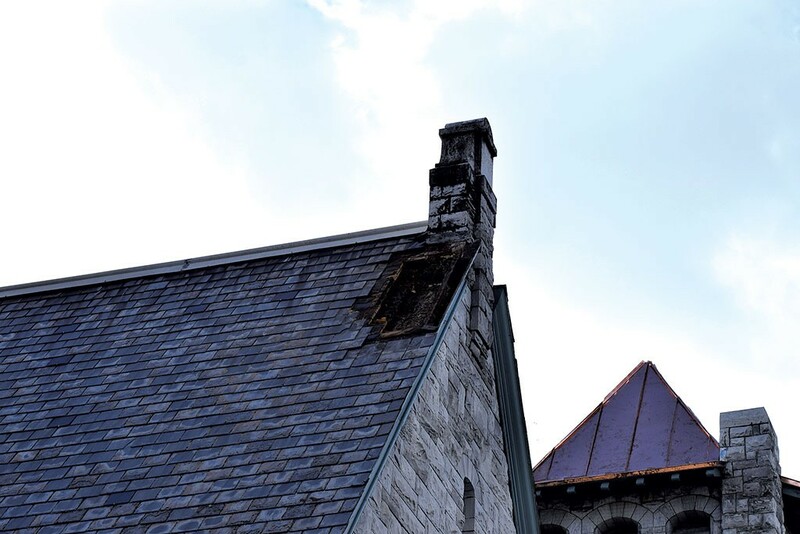 A roofer with a lift was scheduled to replace a portion of the building's roof in November. 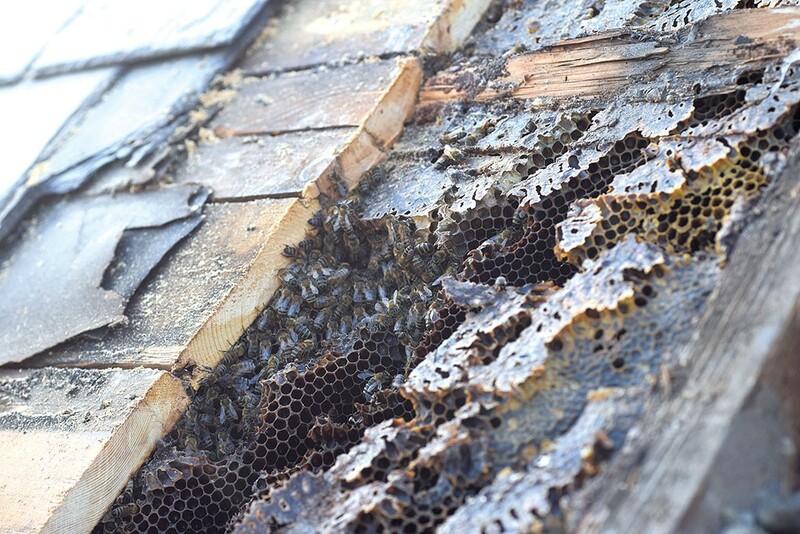 Trustee John Curler, who had also been keeping tabs on the bees' comings and goings for years, asked the roofer to take a closer look where he suspected the colony was living. Then he contacted beekeeper Andrew Munkres. With apprentice Ethan West, Munkres arrived one cold November day and attempted to remove the colony and transport it to his Cornwall operation, Lemonfair Honeyworks. This wasn't the first time Munkres had been called to remove a colony from someone's walls. "We hear from two to five people a year who have a colony in the house," he says. "Most people don't want to rip off their siding, so they end up just dealing with it." Or they call an exterminator. "But then you've killed the bees and melted the wax," Munkres continues, "and you end up with wax on your electrical wires." At the church, the beekeeper did a "cut out" to remove the colony. It wasn't difficult to locate. "If you put your ear right on the roof, you could hear the bees underneath," he recalls. He and West pulled up the roof to discover the colony right below it. So, how exactly do you coax 10,000 honeybees to vacate their cozy cold-weather dwelling? Munkres began by lighting a smoker, which keeps bees from getting too aggressive. He had brought a hive box, already filled with honey, which would become the colony's new home. Then, he simply cut about three or four feet of honeycomb out of the roof and shook the bees out into the hive box. "After we'd gotten all the bees out, we managed to spot the queen just walking around," Munkres says. He picked her up by the wings and transferred her to the box with the others. "Now it was a viable colony, a queen with all her daughters." He brought the bees back to Cornwall and placed them in his honey house cellar, where they'll spend the winter. The colony is big enough to survive until spring, Munkres says, but he can't be sure they'll make it until warm weather comes. "It's obviously pretty disruptive to remove them from their home," he notes. But at least they have honey to eat. "The reason bees store honey is to make it through the winter," Munkres points out. "That's their food. Unlike bears, who store fat and hibernate, the way bees keep warm is by vibrating. It's sort of like doing jumping jacks. In order to keep doing that all winter, they have to eat honey to give them energy." "I thought it was so wonderful that Andrew was able to get the hive and the queen before they died, because it was pretty cold," says Curler. "They were all tucked in, ready for winter." Curler estimates that they were able to salvage about 120 pounds of honeycomb, some of which is currently stored at his house. "I tried some [of the honey] right after we brought it down," he says. "It's a dark honey. It was wonderful." The rest of it is currently stashed in a large receptacle in the church basement. When administrative assistant Melinda Rowe Williams shows it to a curious reporter, the honey looks gnarly and is almost black, but it tastes delicious and sweet. Williams says she took some of the honeycomb home, put it in a double boiler and strained out the honey. "I just had to pick out a few impurities," she says. "We all had it for Christmas morning." There's a reason the honey is so dark, according to Munkres. "When we harvest honey that's going to go into jars in the store, we're trying to get the bees to put that honey into boxes that have never had baby bees raised in them," he explains. The church honey was made in wild, free-form honeycomb, meaning it shared space with babies, larval skins and bee poop. "There's absolutely nothing wrong with it," Munkres says. "There is nothing that could get in honey that would be at all unhealthy for anyone over the age of 1." Some people may actually consider this honey superior, he points out, since the comb contains propolis, a mixture of bee saliva and beeswax that is said to have healthful benefits. To harvest this honey, the comb will be crushed and then strained. Whatever is in the comb becomes part of the honey. The church is planning to sell its honey in a fundraiser to offset the cost of the roof replacement. After all, Williams says, "The roof helped make this honey." They're calling it Holy Honey. "Heavenly honey was already taken," Williams says with a smile. In this era of colony collapse disorder, which threatens honeybees and their habitats, this colony sought refuge in the walls of a church. And the church served them well, Munkres says. "From looking at the comb, we could tell [the bees] were pretty healthy. They seemed quite happy there. They were sharing heat with the church; they kind of had it made," he says. "If it weren't for the honey leakage, everybody would have been OK with it." Want to get some Holy Honey? Visit memorialbaptistvt.org or call 388-7472. The original print version of this article was headlined "Honey Do"